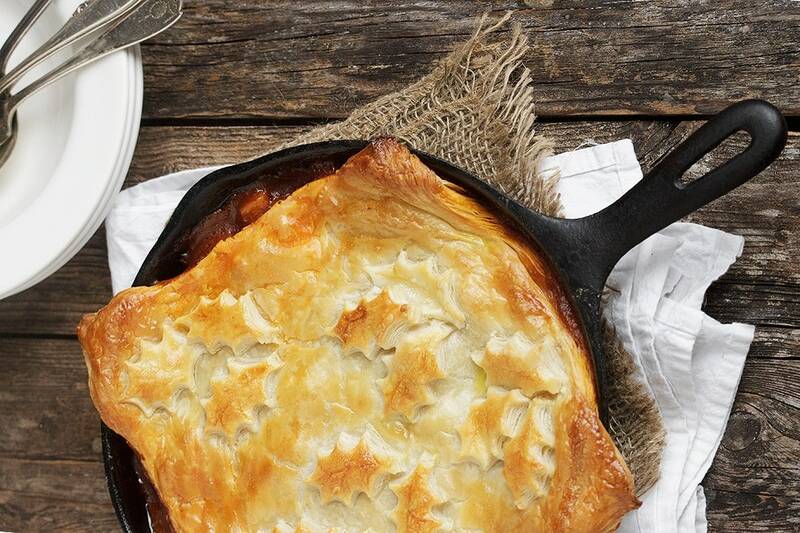 A quick, easy beef pot pie with puff pastry, this Beer-Braised Beef and Vegetable Pot Pie features beer-braised beef, potatoes, carrots and a puff pastry topping. I’m not a huge beer drinker, but I do love to cook with it! 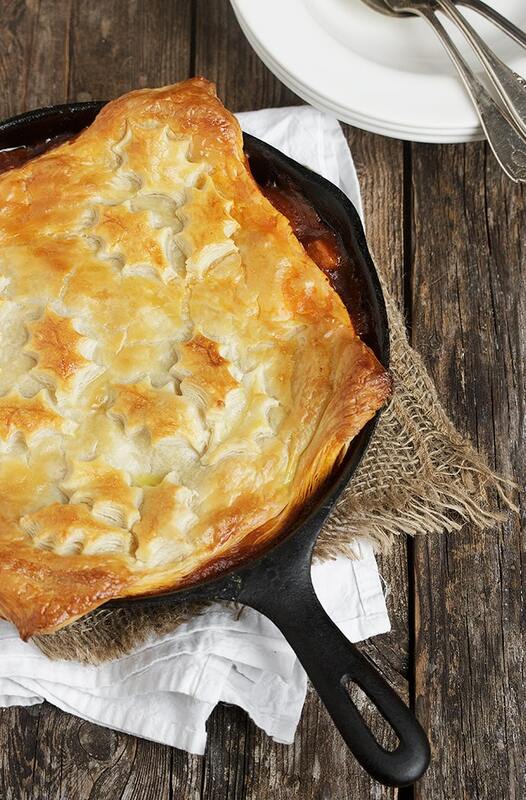 This beer-braised beef pie is a favourite, for a quick and easy meal. The beef doesn’t need to braise too long and then just a quick trip to the oven and this hearty one-skillet meal is ready. You can make the filling ahead and refrigerate, then just allow to come to room temperature, put it in the skillet, top with the puff pastry and bake. The 25-30 minutes in the oven to cook the pastry is the perfect amount of time to re-heat the filling, too. As for the pastry, I use store-bought. I use the extra to add some cut-outs on top, just to pretty it up a bit. You could cut your puff pastry in a round to fit the pan, but I happen to love the crispy, puffy bits that hang over the edges, so I keep it square. Feel free to add any vegetables you like to this pie. Mushrooms would also be a nice addition. This stew can be made with any beer and any vegetables you might like to add. 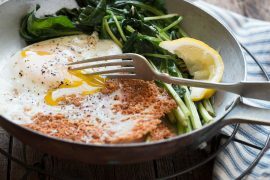 You'll need an 8-inch cast-iron skillet or baking dish. The stew can be made ahead and refrigerated, then baked at meal time. Allow the refrigerated stew to come to room temperature before baking. In a large Dutch oven, heat 1 Tbsp. oil over medium-high heat. Add half the beef and cook, turning several times until seared. Remove to a plate. Add remaining 1 Tbsp. oil and brown the remaining beef and remove that to the plate as well. Add onion and garlic to the pot and cook, stirring, until onion is softened. Add tomato paste and cook, stirring, for another minute. Add the beer, carrots and potato and 1/2 cup of the beef broth. Add the browned beef pieces. Stir to combine. Season with salt, pepper and spices. Bring to a boil, then reduce heat and simmer, covered for 30 minutes, or until beef and vegetables are tender. After 30 minutes, combine the remaining 1/2 cup beef broth with the cornstarch and add to the pot. Cook uncovered, stirring, until sauce thickens. Spoon mixture in to an 8-inch cast-iron skillet or baking dish, place on a baking sheet and set aside to cool for 15-20 minutes. Meanwhile, preheat your oven to 425° F. with rack in the centre of the oven. If your puff pastry is in a block, roll one block in to a square large enough to cover the top of your skillet, with a bit hanging over the edges. If desired, with the other sheet, roll into a rectangle and cut shapes from it using a leaf-shaped cookie cutter. When stew has cooled slightly, lay the rolled pastry sheet over top and then, if using, place the pastry leaves on top. In a small bowl, whisk together the egg with 1 Tbsp. of water and brush this mixture over the puff pastry. Place in the oven (on top of the baking sheet) and bake for 15 minutes, then lower the oven temperature to 400° F. and bake for an additional 5-10 minutes until golden brown. *Stew can be made ahead and refrigerated. Allow to come to room temperature before baking. 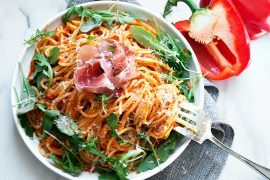 This is really good and I make it all the time. I’ve make it exact to recipe (which is delicious), but have also experimented with different beers. They make the flavours slightly different but just as good. So glad you are enjoying it, Carrie and yes, different beers is a great way to tweak the flavour. Thanks! Hi Jennifer, you really used an 8inch cast iron skillet and served 6 people? Would love to make this; please clarify. Thank you! Yum, looks great! Question: at what stage after initial browning is the beef added back in? I’m guessing with the carrots so it simmers for the 30 min, though I wouldn’t want to over cook it if that’s wrong! Thanks, I look forward to trying this! Jennifer, I just found your site through Pinterest – lucky me! 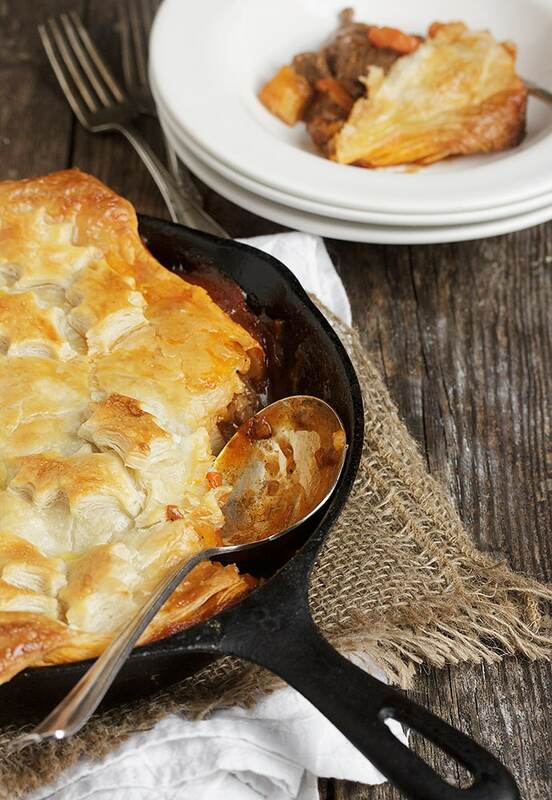 The stew for this pie is simmering now and the house smells wonderful. I am making the pork loin with wine and herb gravy tomorrow. 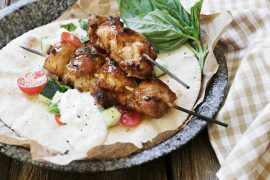 Beautiful site, gorgeous photographs and lovely recipes! Thank you! This looks so warm and hearty, perfect for this time of year! And you know how I feel about puff pastry – yum! This looks so comforting and delicious, Jennifer. Love your decorative puff pastry topping! I’m with you, I don’t drink it on its own, but beer is magical to cook with— I love the leaf decorations on the crust! 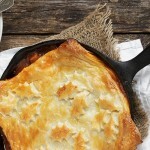 This looks like the most comforting pot pie, love the golden topping! This pie looks so English, Jennifer! Love it. Comfort food at its best for sure. I completely agree I don’t really drink beer that much but it makes stews and meat pies absolutely out of this world delicious. Yes, it’s definitely perfect pub food, Julia :) And beer and beef go perfectly together! This looks so good! Perfect comfort food on these brisk days. I have a special place in my heart for Sam Adams Lager (I really enjoy their summer brews), since they are based in my hometown. Excellent use of a fantastic beer! Thanks so much, Jessie. This lager was great in this beef pie!